Walsall Health 155-5 off 40 overs v Highwood Park 58-1 off 15 overs. Game abandoned due to rain. Before we start the analysis, a big thankyou to Mike Sayers and Neil Van Limbeek for stepping in this week, to help us field a full side. It was really good to see these two back on the field after a spell on the sidelines. The final game of 2017 between Highwood and The Elf, was a game dominated by an excellent fielding and bowling performance from a well disciplined Highwood side. Eager to get the game started because of a poor forecast later in the day, Captain, Ian Chuck won the toss, and elected to bat. Opening bowler, Nai Duncan was more than happy to accept Chuck’s decison, bowling a brilliant opening spell. Its fair to say, that for the first time this season, The Master Accumulator looked in trouble, against the Highwood openers, repeatedly playing and missing against an opening attack sponsored by McVities. After Chuck perished with a Jaffa from Turner, the score was a very pedestrian 33-1 off 15 overs. Higwood had taken charge of the game. Turner continued with the tight line tactics, with Stamps assisting with the asphyxiation process from the other end. Neither first change bowlers were in the mood to give out donations, as the run rate continued to plod along at 2.5 an over. 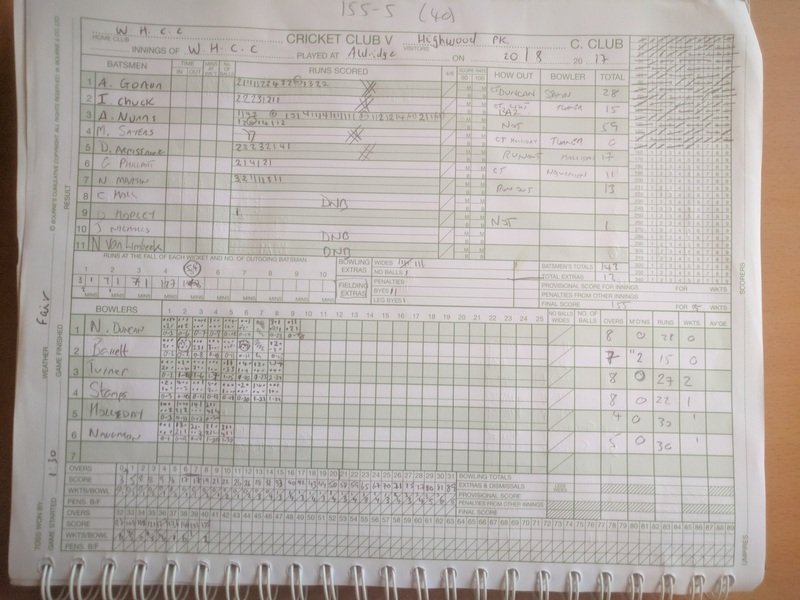 At times, our batting resembled a side who were holding out for a draw, so with the score on 81-3 off 30 overs, a well overdue burst of positive intent began to help us post a respectable target. After Gort departed for 28, Mike Sayers at least set the tone, with a classic Sayers biff, that didn’t quite clear the fielder at long on, unlucky. It was at this point that Captain Chuck made easily one of the most bizzare requests of the season whilst doing a spot of umpiring….requesting the shipping forecast!! So for all our Radio 4 Long wave listeners this match report will continue shortly. Here is the general synopsis issued by the Met Office on behalf of the Maritime and Coastguards Agency at 19:45 BST…Dogger, Westerly, becoming cyclonic, rain at times…good. Lundy, Fastnet…West/North West becoming variable later….fair…good. Elf…run rate…Southerly falling slowly…moderate or poor…. becoming bad. Lets get back to the game. The man in form Alex Nunns was the first member of our top order prepared to take a few chances, and played a nice knock of 59 not out, his 5th 50 for the club, plenty of aerial shots, well supported by Dan Armstrong, Greg and Nathan Martin who all embraced the late cameo role. It was Alex who held the innings together, to help us get to 155-5. A good effort after such a slow start, but still 30 to 40 below par. Still, with a very slow outfield, we hoped we could defend that score. With the rain moving in, we decided to take tea at the end of the game, to try and get a result. The Highwood openers started briskly, with opener Sam Pitt attacking from ball one. Chancing his arm a few times payed dividends, and put The Elf on the back foot. Chris Hall, got an early breakthrough, getting Perks for a blob, thanks to a fine poach from Chuck, while Academy Graduate, Dan Armstrong was unlucky not to pick up a scalp. With the rain getting heavier, Hall slipped a couple of times when landing his front foot on the crease, and started to lose his rhythm. So enter The Legend. The Icon. The Messiah. The Boss. 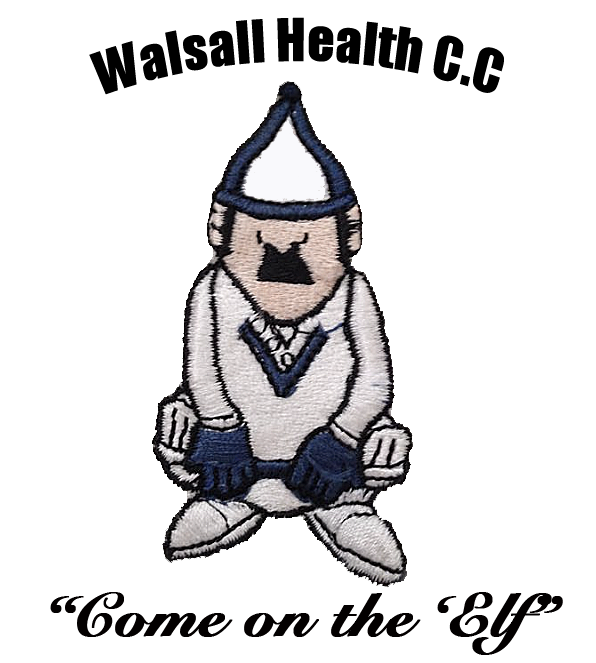 The Man…..John Nicholls to unleash the dot machine. The eagerly anticipated spell only lasted 6 balls, before conditions became unplayable. There wasn’t a dry eye in the house when Jonty’s spell was cut short, all i can say is, God must have been jealous of the heir to his throne. We all trudged off the pitch, with Highwood well in control of the game, Sam Pitt already on 53 not out and the score on 58-1 off 15 overs. Which was well in front of the required run rate. We still had yet to unleash Jonty, Nathan Martin and Dan Hopley, but at the time we stopped, the Highwood boys had been by far the better side from the first ball of the match, batting more positively, and would feel unlucky to be stopped in their tracks by the weather, with the game at their mercy. A shame to end the series this way. Well played to Highwood, and good luck for the rest of the season. Neil Van Limbeek update….There were concerned faces aplenty, when NVL kindly took on scoring duties for the day. Would he break a finger? Strain an eyelash, or even suffer a seizure through lead poisoning. We had nothing to fear, The Iron Tulip completed the task without breaking sweat, and even had the audacity to produce a Cruyff Turn to stop a ball drilled at him by Sam Pitt early in the innings. Tales from the Travelator….Chris Hall’s hiking boots were left redundant today. But with the rain making the pitch slippy, it was more like an edition of Ski Sunday than Sunday friendly. Being called a Prima Donna for asking for sawdust. Very harsh. Alex Nunns stepped in again, carrying a tonne of the stuff single handedly to help out the stricken bowler. A bit of sawdust wouldn’t have gone amiss on Friday. After listening to Nathan Martin’s Tales from the Test, The Friar Park Express admitted to being sick on the train, sick in the street, and sick in his bed, in some truly appalling scenes, worse than any of the antics ever seen on the Ibiza Weekender. The last time i heard of such heaving was when Nath Reeves hit 64 at Didcot. Onto Rushall next week, for the Tim Oliver Memorial Game, and our 500th game. See you all there.